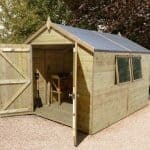 This pressure treated workshop from the Shed-Plus range boasts exceptional quality as well as great value. It is one of the limited overlap sheds which offers strong protection against the elements. What’s really outstanding about this shed’s design is its pressure treated timber. This eliminates the need for yearly treatments and offers an incredible zero-maintenance design. Another thing that’s impressive about the construction of this shed is the double doors. With overlap, bracing is very rarely added to the doors but it is on this model. Ensuring they don’t sag through daily use, this adds excellent durability and they also offer a fantastic amount of entry space to transfer even the largest garden furniture and machinery. There are 6 styrene glazed windows included, ensuring you have an excellent level of light to work in during the day. As it is built with interchangeable sides, you can also choose which side of the shed you would prefer to install the windows on. An apex roof gives the shed a tall, spacious design whilst also protecting it against rainfall and strong winds. To ensure you are receiving outstanding value for money, a 15 year anti rot guarantee is provided. 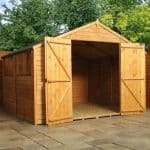 So if you’re looking for a large and spacious shed that requires zero maintenance and won’t break the bank, this is definitely one to consider. Whilst tougher than plywood, the OSB floor may not be suitable for heavy machinery. You can add bracing to the floor to strengthen it however. This is an overlap workshop, offering a spacious and tall interior to make it very comfortable to use. The height measurements are great in comparison to similar sized buildings. Even the height of the door is taller than average so you’ll be able to walk in and out quickly and easily with any size machinery and equipment. The width of the doors is the only measurement that is slightly lower than average. However, the overall opening width is 3’7” so you’re still getting a generously spacious entry point. 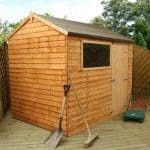 The common apex roof design is what contributes to the brilliant height of the shed. It is covered by a basic quality felt which offers further rainwater deterrence. It doesn’t have a sharp sloping design, but it still drains off any water quickly, preventing it from building up and causing fungus and rot issues. The OSB floor and roof offers adequate stability and strength. Although as it is designed as a workshop we would have preferred to have seen a tongue and groove floor. Considering the price however, you are getting a very strong and reliable building. All we’d suggest is adding either a solid sheet board on top of the floor or extra bracing if you want to use heavy machinery or store any heavy equipment. The reason this workshop is offered at such a low price is because it is constructed with overlap cladding. This tends to offer more of a rough and rustic design and is cheaper for manufacturers to work with. However, this isn’t your average overlap shed. It has been pressure treated for maximum durability. This means you don’t even need to treat the workshop in order to ensure it is protected against the often harsh British weather. Once constructed, it is guaranteed to resist rot and fungus for up to 15 years. This is an impressive warranty considering the majority of wooden buildings, even Shiplap models, come with a 10 year warranty. The workshop also benefits from a thick 45mm x 28mm frame. This is stronger than your average overlap workshop and ensures it is safe to use all year round. If you’re hoping to alter the colour of the building, we’d recommend using a water based treatment that has been especially designed with rough sawn timber in mind. This will ensure you get a more uniformed finish. The double doors featured on this building have been braced and fitted with both a turn button and a pad bolt. This means there’s absolutely no risk of them flying open in strong winds. They have a slightly shorter than average width, but together they open out to reveal an exceptional level of space. So you’ll be able to transfer your bulky machinery, tools and equipment quickly and without struggle. To ensure you have plenty of light to work with, six styrene glazed windows have been added to the side of the building. On the picture you’ll see that they are all placed on one side, but you can choose which side you want them to be installed upon. They have a fixed design so you won’t be able to open them. As sold, this workshop doesn’t offer a massive amount of security. However, its pad bolt does give you the choice to add your own padlock which will ensure whatever you store is kept safely away from thieves. The fact the windows also cover the entire side of the building also mean you don’t get any privacy with this building. Unlike with tongue and groove models, you also won’t be able to add curtains or blinds to improve the privacy of the workshop. 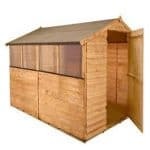 All three of the extras available with this shed are worth buying. Take the 4 shed hooks for example. Overlap sheds have one major disadvantage in comparison to tongue and groove clad buildings. That is, they do not enable you to increase the storage potential inside the shed because the overlap walls aren’t strong enough to hold hooks or shelves. The hooks offered here however are especially created for overlap clad sheds and they literally just slide right in between the panels. No nails are required, making them incredibly easy to install. A padlock and a security alarm kit are also offered. These are highly recommended if you’re worried about securing the building. In terms of overlap sheds, this is one of the highest quality models available. Traditional style overlap has been used for the strongest build. The thing we were most impressed with is the longevity of the shed. Pressure treated, it is going to last for at least 15 years and that’s without the need for any treatments. Being one of the largest sheds out there, the storage space provided is fantastic. The only thing that prevents us giving it 10/10 is the fact the wood isn’t strong enough to handle shelving. However, you could add light storage units for additional capacity. 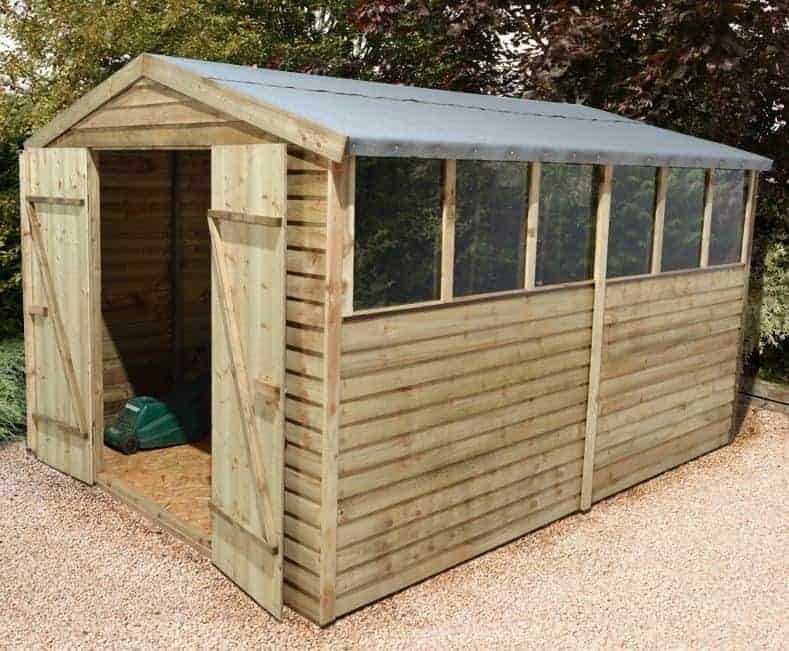 Though easy enough to put together, the size of the shed means it is going to take quite a lot of time and manual labour to install. All fixings are included and you are also provided with clear instructions. 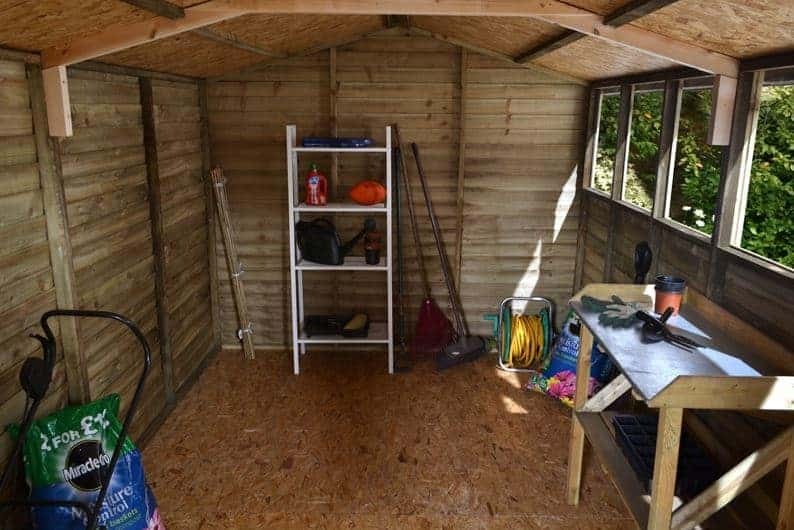 If it’s value for money you are looking for, this is definitely the shed for you. 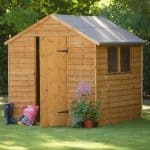 It is one of the longest lasting budget sheds available on the market and the fact you don’t need to treat it saves you money annually. Final Thoughts: Rarely will you come across an overlap workshop as superior as this pressure treated Shed-Plus model. The pressure treatment increases the anti-rot guarantee to 15, rather than 10 years. 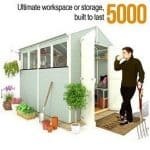 It comes with a lot of great, useful features including braced double doors, 6 styrene glazed windows, a pad bolt, a height boosting and weatherproof apex roof and interchangeable sides. Suitable for light to medium weight storage, the OSB interior helps to keep costs low whilst offering great stability. If you need to store heavy machinery however, we would recommend strengthening the floor. Overall this is an extraordinary shed that requires zero maintenance.